So you’ve acquired a new hunting rifle. After saving your hard-earned cash and landing permission from your other half, the gun rests in your hot little hands. It looks great, feels great… it probably smells great… but more importantly does it shoot great? Now its time to hit the range and get this baby sighted in. Truth is the same holds true for rifles we’ve had for many years. Chances are they don’t require the full-meal-deal, but sighting in, confirming that our equipment is in good working order, or realigning sights is something we should do on a regular basis. Unfortunately many of us try to kill two birds with one stone. We visit the range infrequently and attempt to sight in and practice shooting all at the same time. It’s important to remember, sighting is very different from regular shooting practice. The process of sighting in involves aligning the scope (or other sights) with the firearm when using a specific bullet and load. Shooting practice involves discharging and often experimenting with different positions to allow our bodies to grow accustomed to the form and function of shooting. Believe it or not, many of us don’t sight in properly. It never ceases to amaze me how many hunters pick up their guns once or twice a year, assume it’s shooting straight and hit the woods without a second thought. As a professional outfitter I see it all the time. In fact, I’ve seen guests take it personally when, after arrival in camp, I ask them to take a few practice shots – just to make sure their gun is properly sighted in. As though I’m insinuating that they haven’t prepared for their hunt, once in a while I get a hunter who thinks I’m a control freak. Then the truth comes out. After a few shots it becomes obvious; better than half are inevitably in need of scope adjustments. 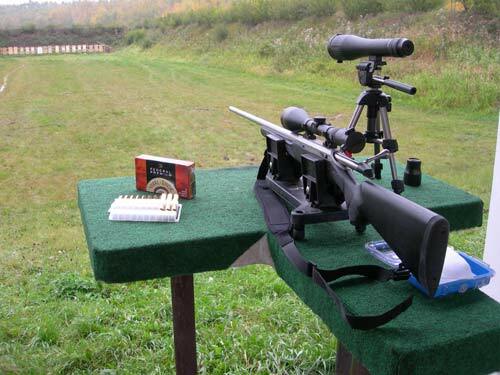 Every one swears that they were shooting one-inch groups at home, but now their rifle requires major scope adjustments. In their defense, a multitude of things can happen to guns in transit. Blunt trauma to cases or directly to the scope itself can throw it way out of whack; hence the need to sight it. This first step applies mostly to rifles and scopes that have a new marriage. The first time a scope is mounted to a rifle the gunsmith will usually use a bore sighting tool. This tool is used to approximately align the crosshairs of the scope with the rifle barrel. Unfortunately some folks erroneously rely on bore sighting alone to zero their gun. Remember bore sighting can be precise but most often it only approximates accuracy. If, when you visit the range, you discover that you’re not even hitting the paper at all, consider rough bore sighting your gun. Practical with bolt-action rifles, by removing the bolt, you can stand behind the gun, look through the barrel and center the target. Then without adjusting the gun, look through the scope and make the necessary adjustments to bring the crosshairs in alignment with the target. This should get you hitting the paper in no time, then you can move on to shooting. To reliably confirm the accuracy of your rifle and scope, you must shoot from a rest. I’m not sure I should say this or not, but I will. To illustrate the naivety of some, I’ve actually witnessed guys trying to sight in their rifles at the range by shooting freehand from a standing position. Needless to say these are the guys that get frustrated because they’re not hitting anything. Remember, when we’re sighting in our rifles we’re not testing our shooting skill, but rather the accuracy of the gun, scope and bullet being used. Our goal should be to eliminate or at least minimize human error and allow the equipment to do its thing. With this in mind, a stable shooting bench or table is always recommended. 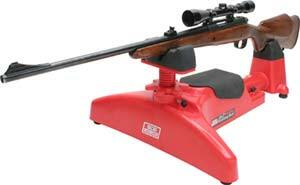 Most shooting ranges are furnished with suitable tables or benches and adjustable stools. If you’re using a portable bench, make sure it is resting level on solid ground. Likewise, it’s imperative to use a shooting rest. In my opinion a vice can be that much better. I really like MTM Case-Gard products (www.mtmcase-gard.com). They make a variety of shooting supplies that are both affordable and practical. Few of us exhibit perfect shooting form. By understanding the biomechanics involved with aiming, breathing, squeezing the trigger and following through we can better acknowledge how to eliminate torsion while shooting from a rest. By cradling the rifle fore-end on a rest or in a vice, we can align our sights with the downrange target and maintain that alignment for a long period of time. Then, by gently squeezing the trigger to discharge, we minimize our human influence thereby allowing the firearm to perform more or less on its own. I’ve heard much discussion about the standard 100 yard shot and arguably for most bore-sighted rifles, sighting in at that distance is fine. But talk to the pros and most will agree that you should begin at 25 yards if you want to do it right. Making adjustments at close range is easier than at longer distances. At 25 yards you’ll find it easier to acquire your target; it simply appears larger and is easier to center the crosshairs at this short distance. Inaccuracies are simpler to rectify and adjustments can be made quickly at that distance. Remember, inaccuracies are exaggerated that much more at greater downrange distances. As you make your fine adjustments to your scope, be aware of the increments and don’t overdo it. For example, with my Leupold VXIII, one click = 1/4 inch adjustment. So, if my shots were hitting consistently two inches to the left of center, I would likely need to dial the adjustment eight clicks in that direction, then shoot another round of bullets. Some folks disagree, but in my opinion it is better to make subtle adjustments, then shoot to confirm that you are working toward the zero mark. As long as there are no fliers, a series of three shots is typically representative of where the gun is shooting. Although with today’s scopes I don’t believe it is as crucial, I still like to give it a firm tap to seat the crosshairs after each adjustment. When your rifle and scope are in sync at 25 yards, move to 100 yards. Most big game rifle and bullet combinations that are sighted in a couple inches high at 100 yards will shoot a hair low at 25 yards – with most deer hunters this is considered ideal (e.g., I like my 300 Win Mag to be 2″ high at 100 yards). Once your rifle is sighted in, try shooting at 200, 300 and 400 yards to better learn how your rifle, scope and ammunition perform at greater distances. Not all ammunition performs the same. Be sure to sight in your rifle with the load that you plan to hunt with. Ballistics of variable bullet weights and designs (not to mention manufacturers) will perform differently. For instance, Winchester Ammunition’s 150 grain Supreme Elite XP3 (www.winchester.com) will inevitably perform differently than Remington’s 180 grain Core-Lokt, PSP (www.remington.com) shot out of my 300 Winchester Magnum. If you reload your own ammunition, then you’re likely acquainted with factors affecting bullet performance. Working the right load may take some trial and error, but the same applies – always sight in with the bullet and load you intend to hunt with. Sighting in can be as labor-intensive as you make it. As a rule, several items are required and several more make the job that much easier. 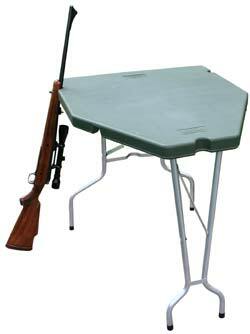 As an absolute necessity, we require a table or bench, a shooting rest, our rifle, ammunition and a target. Beyond these basics, the job is much easier with a spotting scope, tripod, and additional targets along with a marker. As you begin shooting, be sure to analyze and record each shot. I like to use a Bushnell Elite 15-45x 60 mm spotting scope (www.bushnell.com) mounted on a solid tripod. At 45 power magnification, I can see every detail on the downrange target. My scope allows me to closely assess where I hit in relation to where I aimed. Further, many shooters like to keep a matching target on the bench while they are shooting. By checking their shot, then marking it on the target beside them, they can better track their progressions to confirm any scope adjustments and accuracy. This eliminates much of the guessing about which shot was which.